If you're looking for a piece of Renoir to hang in your home, then this tapestry 'Renoir Spring Bouquet' can fulfil this this role. `Why shouldn't art be pretty?' 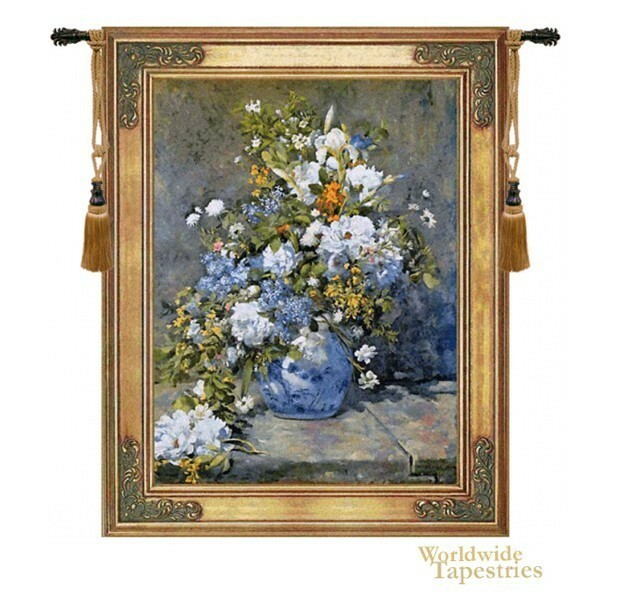 said Renoir, and this tapestry based on a painting of Renoir is no exception. Pierre-Auguste Renoir (1841 Ð 1919) was a French impressionist painter like his contemporary Monet, and his works typically involve pretty subjects such as flowers, young women, and scenes from nature. Here we see his work depicting a vase of floral species. The vase is equally floral and ornate and its shades of blues complement the white and blue blooms in the bouquet and the blues in the background. The flowers and the wall behind are portrayed in impressionistic style and this creates a certain mood, one of which only a master impressionist painter can achieve. This tapestry is backed with lining and has a tunnel for easy hanging. Note: tapestry rod and tassels, where pictured, are purchased separately.